Hope everything is fine in your little world. Today's post is a quick one just meant to show you a variation of buttonhole stitch. This stitch is not my creation. It was in fact demonstrated by a fellow blogger,Lakshmi, long time back. Since the tutorial has been taken off and a few in the hand embroidery group on FB were searching for it, I decided to post a "how to" for the same. Two flowers with buttonhole stitch. Anyway, did you notice any difference? You can click on the pic for a better view. The left is normal buttonhole stitch and the right is the backless buttonhole. If you observe carefully, you can see that for the right hand side flower, between the normal buttonhole stitches there's an extra stitch coming in.That's the catch!!! Now let me show you how it is done. Again apologies for the poor pics. Lesson learnt - What looks good in mobile,may not turn out to be so in real. In the normal method, you have to go down at A and come up at B to complete the stitch. In the backless buttonhole , there's a little bit extra up and down involved. Down at A,up at B,down at C and up at D. The AB and CD stitches should be kept small. Click on the pic for a better view. When this method is used with two strands of variegated silk thread, you get a shaded effect. I hope the method is clear. Do try it out and let me know your thoughts on this variation of buttonhole stitch. 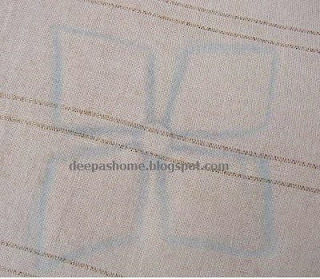 Thanks a lot, Deepak.Shaded or backless, this was the stitch I was looking for. The backless buttonhole has an added advantage of adding Texture & Filling to the front side of embroidery ! One does not need to 'fill the gaps' with straight stitches ... gaps which are natural when working on uneven arcs. I hadn't seen this stitch before, so thanks for posting it. This would certainly add more interest and texture.